Need the most epic birthday cake for an upcoming celebrations? I’ve got you covered with this incredible creation! I love celebrating birthdays (my favorite day of the year!) and the special day calls for a special cake! My ultimate birthday cake is an over-the-top, crazy-looking, ocean and coral inspired creation! I enjoyed adding all the little details like the rainbow sprinkles, blue ganache and the purple sugar crystal. If you’re looking for a creative birthday cake, try making this one for an unforgettable dessert! p style=”text-align: center;”>For all the decorating details, watch my video recipe and decorating tutorial! Want new recipe updates? Subscribe to my YouTube channel to get a notification each time a new recipe goes live! I start this cake out with relatively simple vanilla cake dotted with rainbow sprinkles, the frost the cake with a simple vanilla buttercream. And that’s where the basic stops! 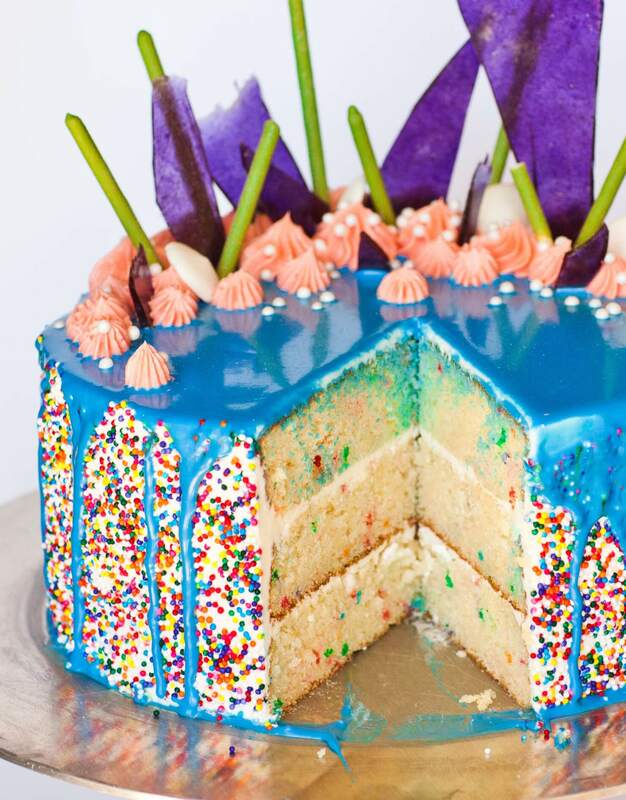 To garnish this cake and take it to extraordinary, I made my own purple-colored sugar crystals! These are actually very easy to make and they look so impressive. Then I added more rainbow sprinkles on the side, because who doesn’t like sprinkles? And to add some bright color, I also finished the cake with a blue-colored white chocolate ganache and match green tea poke sticks. Soo much going on with one cake but then, it’s a cake for a very special day! Prepare the vanilla cake layers. Preheat oven to 350F and line 3, 8-inch cake rounds with parchment paper. In a large mixing bowl, cream together the softened butter and sugar until light and fluffy. Add the eggs, vanilla and milk and mix until smooth. In a separate bowl, combine the flour, salt and baking powder. Mix together, then add to the cake batter. Whisk just until the flour is incorporated; avoid over-mixing. Fold in the rainbow sprinkles. Divide the dough evenly between the three prepared pans. Bake in preheated oven for 35-40 or until a toothpick inserted into the center comes out clean. Allow cakes to cool completely on wire racks. Prepare the butter cream. Whisk the softened butter on high speed until light and fluffy and white in color. Add the vanilla, salt and begin adding the confectioner's sugar. Whisk well after each addition of the sugar and scrape down sides of bowl. Reserve about 1 cup of the frosting in a separate bowl and color it pink for decorating the top. Assemble the cake. If you wish to add more flavor to the cake with fruit preserves or flavored sugar syrup, do so between each layer. Frost each layer with buttercream, then frost top and sides. Level the top and sides with a flat spatula. Transfer the cake onto a cardboard round and onto an inverted bowl/cup over a baking tray. Measure out about 1/2 cup of rainbow sprinkles and use your hands to gently press the sprinkles into the sides of the cake. Once sides are well-covered, transfer cake into the refrigerator and allow it to chill for about 30 minutes. Meanwhile, prepare the chocolate ganache. Combine the white chocolate and cream in a small bowl and heat in microwave until smooth. Add about 1/2 teaspoon of white food coloring; this will make the ganache less opaque and the food coloring more vibrant. Add the blue food coloring. Allow the chocolate ganache to cool slightly. Transfer the ganache into a disposable bag, cut off the tip and drizzle down the sides of the cake and over the top. Chill the cake again and allow the ganache to set up a little bit before decorating the top. Transfer the reserved pink buttercream into a pastry bag and pipe onto the cake. Garnish with broken sugar crystals, pocky sticks, pearls, chocolate wafers and gold dust. Keep cake refrigerated; remove about 1 hour prior to serve to allow the buttercream to soften. To prepare the purple sugar crystal: combine the 1 cup sugar with 1/2 cup water in a small saucepan. Cook the syrup over medium heat until the syrup caramelizes into an amber color. Add purple food coloring, then pour the hot syrup over a baking tray lined with parchment paper. Allow the sugar to set, then break apart with your hands. I was wondering when you put the rainbow sprinkles by hand does is it normally the buttercream still soft ? Isn’t it will stick in your hands? I actually put them on while the buttercream was still soft. I think once the buttercream is refrigerated and set, the sprinkles don’t stick on too well. Why in American buttercream you usually put so much sugar? For example, 300 gr of butter and 600 gr of sugar. Is it not so sugary? Hi! 🙂 The confectioner’s sugar is what thickens the buttercream, otherwise it would be more runny and harder to work with! Hi Tatyana! I wanted to ask where you bought your cake turn table from? And what essential tools would you recommend to someone who is starting out with cakes? Hi there just wondering what kind of white coloring did you used? I’m new in baking stuff..im not familiar with those. Thanks. Just wondering did you cut the top of the cake before you put the filling in it? How many grams should be in each pan? Can this recipe be used for cupcakes ? What’s the difference between this vanilla sponge and the perfect sponge cake video on your YouTube channel ? Which one is better and more moist? Hi! I am making this for my daughters 2nd birthday this weekend and can’t wait! I do need your advice.. I want to prep this the day before and I am wondering at what point in the process of assembly/decorating would be best to stop and put in the fridge for the night and resume in the morning the day of the party? Also, what is the best way to store it in the fridge? Hi! Happy birthday to your daughter! I’m sure she will love the cake! I recommend decorating the cake entirely, except for the pocky sticks and sugar glass, which are tall and might not fit into the refrigerator. You can add them right before serving. As long as the cake is frosted, you can store it in the refrigerator with no cover. Hi Tatyana. Thank you for this beautiful cake. Can I use your stabilized whipped cream recipe instead of buttercream for frosting? Is it ok to pour ganache over whipped cream?